This is a friendly reminder for our Saraswati Puja on Saturday at Sanatan Dharma Temple (15311 Pioneer Blvd. Norwalk, CA 90650). This event is free for annual members and sponsors. The suggested donations otherwise are: $25/solo, $30/couple, $35/family, and $20/student with ID. As you all know, our superb Food Committee does a tremendous job when it comes to our events. We are truly grateful for their dedication. See the mouth watering menu in the schedule. Click here to RSVP by Wednesday! The Ankur Dube Memorial Talent Show participants are all set! We sincerely ask that you be seated by 2pm as the kids have been working really hard with each of their performances to showcase their amazing repertoire. They need your support and encouragement as always. Also do not miss your only chance to see the hilarious original contemporary ensemble play "CHOMKE DEBO" after it's grand success at NABC 2017. Directed by veteran theater and film director Robin Podder (felicitated for his outstanding achievements in "Contribution for Bengali Performing Arts" at NABC 2017). 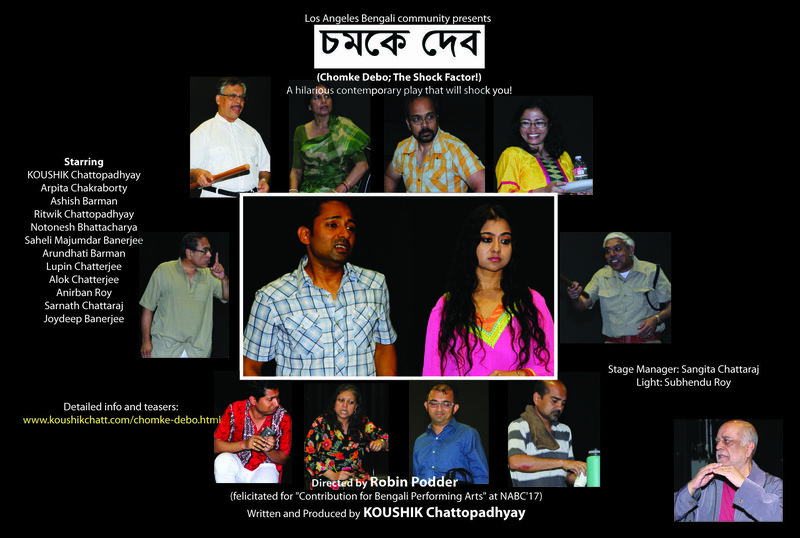 Written, produced and acted in the lead role by Dr. KOUSHIK Chattopadhyay.